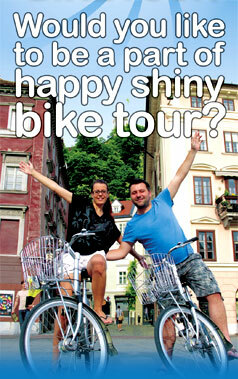 We will bike till footsteps of Šmarna Gora and then hike to the most popular hill just on the outskirts of Ljubljana. Although it is called mountain, it’s just 669 meters high and the fastest people get to the top in only 12 minutes. We’ll take it easier and probably walk for around 45 minutes to 1 hour. From the top we’ll see a great view across Ljubljana and further away. It is also great place to get some fresh air in your lungs…:) In restaurant up there you can find delicious Slovenian meals soo We’ll grab a late afternoon lunch and then return to centre of Ljubljana in the evening. When? Start 3 p.m., finish around 8 p.m.